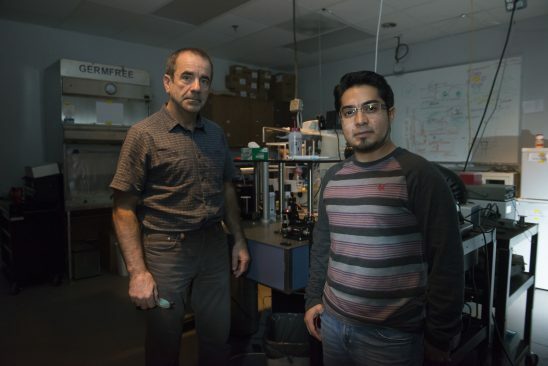 Pegasus Professor Aristide Dogariu, left, and doctoral student Jose Rafael Guzman-Sepulveda have developed a real-time blood monitor that's been tested during open-heart surgery on infants. “I absolutely see the technique having potential in the intensive care setting, where it can be part of saving the lives of critically ill patients with all kinds of other disorders,” said Dr. William DeCampli, who is chief of pediatric cardiac surgery at Arnold Palmer Hospital for Children and a professor at the UCF College of Medicine. DeCampli helped develop the technology and test it during surgery on infants. Doctoral student Jose Rafael Guzman-Sepulveda, who has studied real-time blood monitoring during surgery for the last year, helped to design the instrumentation and integrated it into the heart-lung machine. “I needed to master not just the optical and signal processing instrumentation, but also the technology of the heart-lung machine, which I was able to do,” he said.